Jumping the Bandwagon, I finally decided to write about the latest craze: Selecta/Unilever’s freshly-imported Magnum Ice Cream. A few disclaimers: I am not a dessert lover. I do, however, fancy vanilla-flavored ice cream over other flavors. I’ve been reserving this post until I manage to taste all three varieties, and since I got treated again today, I can finally surely say that this ~60 Php Ice cream bar is simply over-hyped. I first tasted the Chocolate Truffle variety early this month out of my own pocket at 55 Php from 7-11. It was claimed to be the best tasting of the lot. My first impression was from the size, or lack thereof, of the thing. It was… not as big as I wanted, comparable to a pinipig bar only costing five-fold. I let that stride because it’s supposed to have a taste premium for its supposedly unique flavor. Sadly, it also failed in that aspect. This is something I’ve tasted before, and something I’ve had better of. I would’ve preferred my chocolate dark and bitter. I got essentially the opposite: sweet and milky. 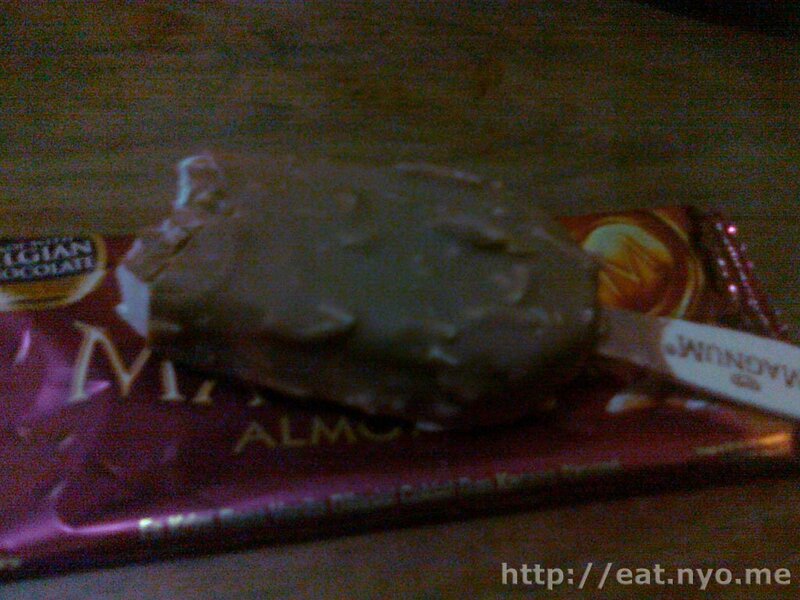 While I do admit that it tastes good, it just doesn’t deliver a unique taste for such a costly ice cream bar. Hint: this tastes oddly similar to the plain chocolate ice cream of a certain ice cream brand with “Bunny” in its name. Last week, I got to taste the Classic variant. This was a simple bar of vanilla ice cream covered in the same Belgian chocolate coating. It was, well, similar to most chocolate-coated vanilla ice cream I’ve had, further supporting my first impressions. However, I didn’t have any remorse as the cost didn’t come from my pocket this time. Also, it was cheaper at 50 Php, not because of the flavor, but because it was bought from Savemore. I finally got to taste their Almond variant today. The main difference between this and the classic one is the presence of almonds in the coating. It didn’t really change my impressions at all, although it did add some nuttiness and crunchiness. Let me put things into perspective: For the price, you could’ve bought yourself two Cornetto cones or three sundae cones from Ministop or four Pinipig crunch or five dirty ice cream cones from your street vendor or one Korean Ice cream from Don-Day or a far superior Dilly Bar from Dairy Queen, any choice would garner you change. Again, I’m not really a dessert fanatic, but I find those listed above a comparable or better taste to any of the Magnum flavors. Don’t get me wrong: it tastes good. It just doesn’t taste as good when you think of how much you spent on it. Also, it doesn’t really deliver a one-of-a-kind unique tasting experience as promised. If you really have to try it out, then just try it. Chances are, your curiosity will finally be sated and you won’t crave for it again. 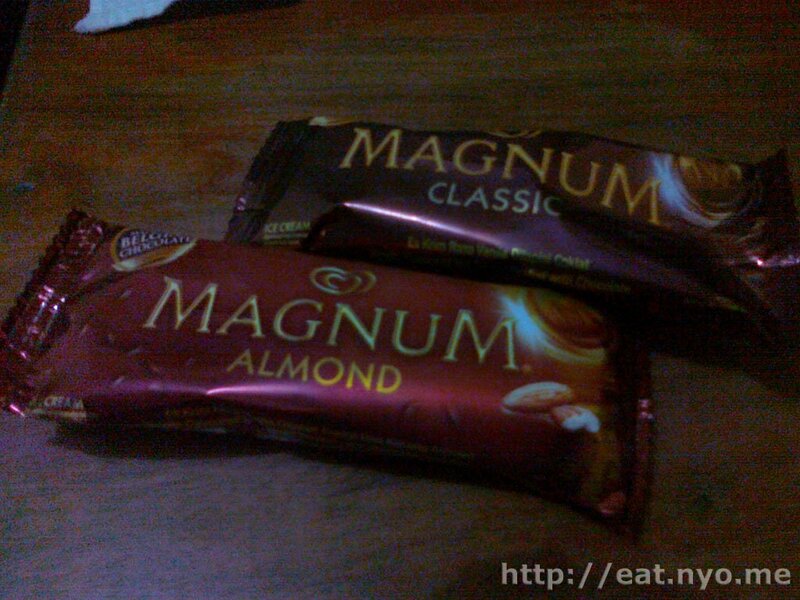 I’m willing to bet that the only time you’ll be happily eating your Magnum Ice Cream is when you didn’t pay for it. Location: At your nearest 7-11 nationwide (?). Not recommended for: The poor. Smart nomnomnom tip: If you really want a unique ice cream experience, try out Merry Moo.